The first Secondary Schools Team Sailing contest between Australia and New Zealand was held in 1984, when Auckland Grammar School travelled to Brisbane to sail against two Brisbane teams. The contest was sailed in 420 yachts. This inaugural contest was won by Brisbane A, taking home the Epiglass Shield. In 1985, Macleans College won the New Zealand National Championships and travelled to Sydney to sail against Sydney Grammar School in Northbridge Senior 14 foot yachts. Macleans won this series. 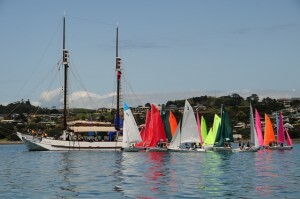 The first time the event was held in New Zealand was in 1986 at Takapuna, sailing Sunburst yachts. Healing Industries were fundamental in setting up Secondary Schools team sailing in provincial Australia and New Zealand, plus the initiation of the Interdominion Contest. Epiglass provided continuous sponsorship for 17 years. The Interdominion is now an annual event hosted alternately by each country, except there was no contest held in 2004 and 2012. When sailed in Australia, Pacer yachts are used and New Zealand continued to use Sunbursts, until they purchased 420 boats following the ISAF Team Racing Worlds held in Auckland in 2003. In 2006, New Zealand hosted an expanded format of the event, involving the top three Open teams from each country. The benefits of this were to spread the skill base in both countries, with the aim to improve the competition in the Southern Hemisphere, helping to catch up again with the Northern Hemisphere. In 2009, the first ever all-girls school team sailing competition between New Zealand and Australia was initiated. 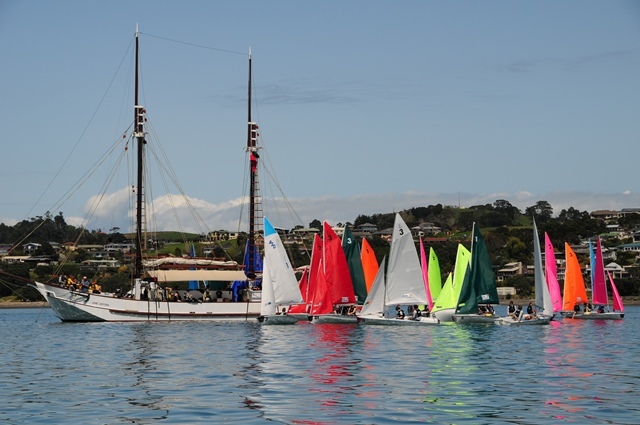 Moreton Bay Girls, being the only girls’ team to reach the Australian Nationals, sailed against Napier Girls High, the top New Zealand girls’ team. Following on in 2010, as a parallel event, the NZ Invitational Girls’ Schools Team Sailing Championships was held. Two Australian girls’ teams attended the event, with four New Zealand girls’ teams, to bring the numbers up to six, equalling that of the Open division. 2018 was the first time that three girls’ teams from each country attended.